Oh my dear friends! I have been away from home for two weeks. TWO WEEKS. It was awesome, and pictures are to come. But last night I was lightening my book collection (my hometown library is getting a new horror section, hooray!) and I found my yearbooks. What a delight! I was surprised at how much I had forgotten. But here are two (grainy) pictures that I found. This was me in a play. Told you I was blonde. And apparently angry. 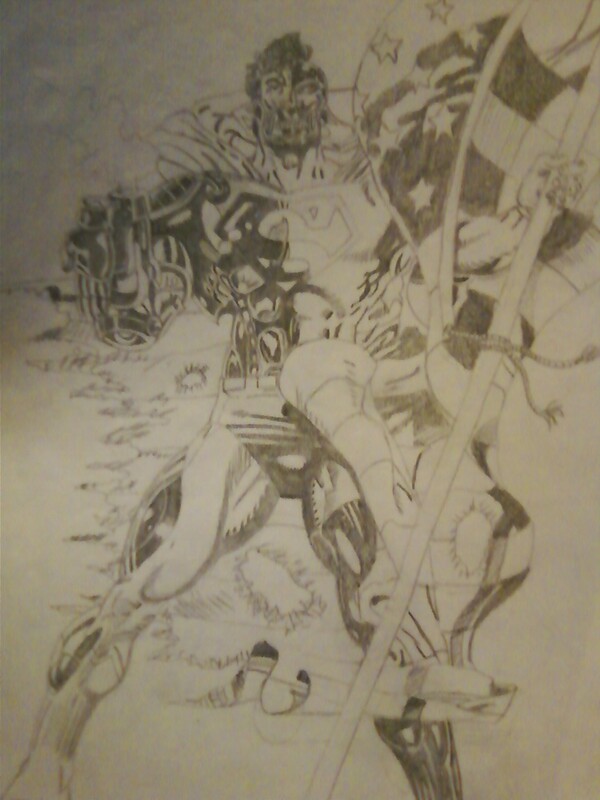 And this is a picture of Cyborg Superman that my friend drew and gave me as I graduated. It’s incredible. I would LOVE to see what everybody looked like in school. Do you have any pictures to share? It’ll be like an online slumber party! You know what I looked like in high school, it’s Aimee Giles. Way to be writing and following your dream, you’re a super inspiration to me. I’ll never forget your notebooks filled to the brim with your teeny, tiny writing so you could fit more writing into your notebooks and use less paper. You were going green long before going green was the “in” thing! I’ll see what I can find. A lot of Aqua Nets died for me to look that good, though.